You can place a schedule on a drawing in Layout or Model Space in RebarCAD. The Tick and Tag command can mark the invisible ends of lapped bars using a tick and the bar mark will be placed in the form of a tag, use the Tick to identify the extent of the bar and the Tag to identify the bar using its bar mark and help to understand the placement of rebars in heavily reinforced elements. The Alternate Range Command saves time when two bars of different size / shape / length are to be placed alternately in an area of the structure with the same spacing, be used where the laps are staggered and be used in a wide range of elements like slabs, retaining walls etc. The Compact Bars Command can reassign the bar marks in a consecutive sequence which might be lost due to deletion of bar sets and by matching bar marks, allow the user to assign bar marks in a required sequence for bars assigned to each drawing sheet or member and ensure that bar marks are sequential, making your bar marking effective. The Match Bars Command can match the bar marks of any bars with the same properties, automatically match the bar mark numbers or the user can choose the matching bar mark number and saves labour time by eliminating the repetitive work of cutting similar bars. 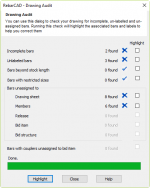 The Drawing Audit Command in RebarCAD can quickly fix your drawing and save you time by identifying missing bar information, easily highlighting the incomplete, unlabelled or unassigned bars and checking, repairing, and offering error free drawings. 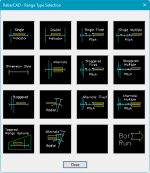 The draw bar command in RebarCAD can calculate bar lengths and number of bars automatically, provide different range styles for various structures and bar arrangements and allows you to draw bars in the desired shape, diameter and view. The draw bar command in RebarCAD can be used where bars are represented using single lines, easily draw rebar for various structures like footings, columns, slabs etc and draw bars in the desired shape, diameter and view.